Human Anatomy is interesting, isn&apos;t it? But let&apos;s see how all this is related to C++ and OOPS. Here we will try to explain all the OOPS concepts through this example and later we will have the technical definitons for all this. If we walk using our hands, and not legs, here we will change the parts used to perform something. Hence this is called Overloading. And if there is a defined way of walking, but I wish to walk differently, but using my legs, like everyone else. Then I can walk like I want, this will be called as Overriding. Now, let us discuss some of the main features of Object Oriented Programming which you will be using in C++(technically). Objects are the basic unit of OOP. They are instances of class, which have data members and uses various member functions to perform tasks. It is similar to structures in C language. Class can also be defined as user defined data type but it also contains functions in it. So, class is basically a blueprint for object. It declare & defines what data variables the object will have and what operations can be performed on the class&apos;s object. Abstraction refers to showing only the essential features of the application and hiding the details. In C++, classes can provide methods to the outside world to access & use the data variables, keeping the variables hidden from direct access, or classes can even declare everything accessible to everyone, or maybe just to the classes inheriting it. This can be done using access specifiers. It can also be said data binding. 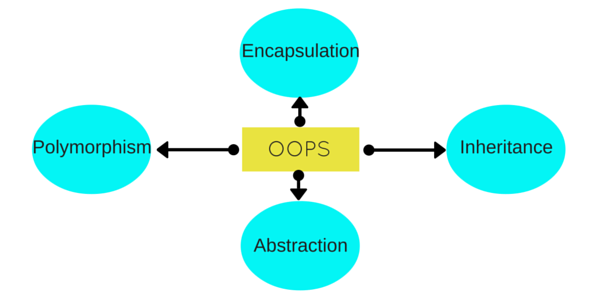 Encapsulation is all about binding the data variables and functions together in class. Inheritance is a way to reuse once written code again and again. The class which is inherited is called the Base class & the class which inherits is called the Derived class. They are also called parent and child class. So when, a derived class inherits a base class, the derived class can use all the functions which are defined in base class, hence making code reusable. It is a feature, which lets us create functions with same name but different arguments, which will perform different actions. That means, functions with same name, but functioning in different ways. Or, it also allows us to redefine a function to provide it with a completely new definition. You will learn how to do this in details soon in coming lessons. Exception handling is a feature of OOP, to handle unresolved exceptions or errors produced at runtime.